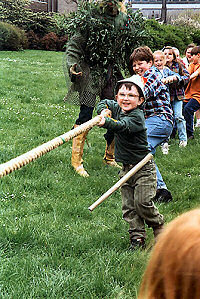 The Green Man encourages children in a Tug of War. 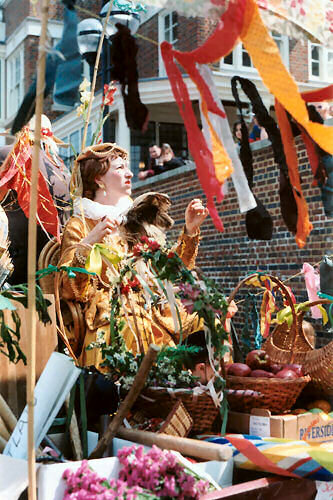 May Games is one of our three theatre-based seasonal celebrations held in Southwark, London. Currently we are seaking funding in order to repeat this event. If you are interested please contact us at info@thelionspart.co.uk. 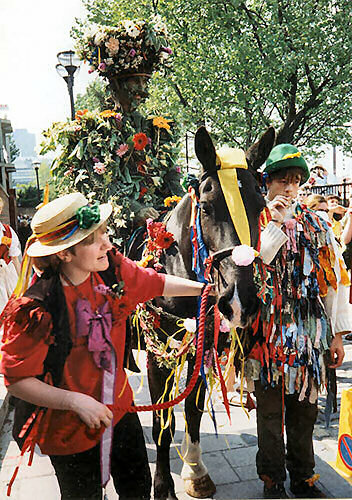 The plays, customs and age-old folklore that make up May Games are all rooted in time-honoured Maytime festivities. The welcoming of Spring, the joy at the return of 'the green', these activities go far back in history, and we are reviving them for the same reasons of celebration: to welcome the returning splendour of the sun... a gratulation of the spring . The late 20th century is struggling to sustain a sense of the natural world within its urban enclaves. The re-introduction of celebrations of the seasons on the urban streets where they were enjoyed before, is a way to connect again with nature. Robin Hood is our protagonist. He leads the 'dance' of the May games in combat-and-reconciliation plays, with the wild folk figure of the Jack-in-the-Green garland. Records of these plays go back as far as the 14th century. The plays we perform are texts based on extant material from the 1470s, with a fresh helping of later verse. 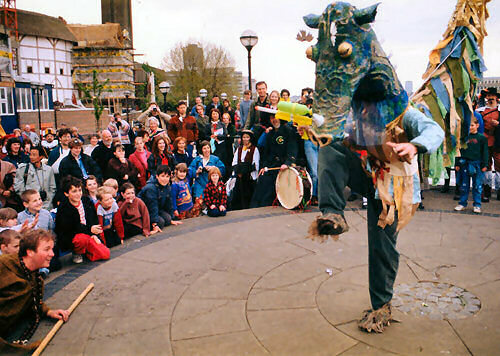 Other characters are equally traditional: the Lady of May (Mary, Magdelene, Marian...), the Dragon (ours is a Thames Dragon), the Hobby Horse, the Maypole and the much-loved followers of Robin Hood. and many merry men with him; and there they live like old Robin Hood of England. They say many young men flock to him every day, and fleet the time carelessly, as they did in the golden world. 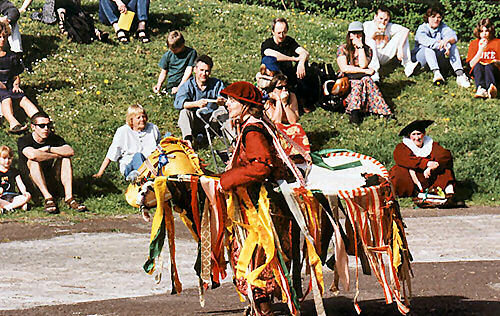 The Green Man arrives on a real horse. 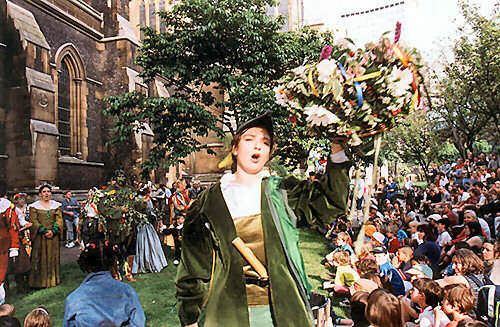 Robin Hood with a crown of flowers. Perhaps the banner was used in a procession before the play. 3d. Lawn is fine linen cloth, and arsedine is tinsel. The Morris Dancers had to be fancy! 10d. Being played by a man, the lady couldn't use a gown of her own ... 8d. Nowadays we have to talk to the Parks Authority and the Police. In 1506, they probably had to have the Bishop's permission to perform, and pay this fee. 19s 6d. Was the lutenist only the taborer's assistant, being paid so much less? 6s 8d. Theatre companies still borrow costumes from each other, sometimes for money. 17s 4d. Item paid for 2 pair of gloves for Robin Hood and Maid Marian 4 1/2d. The most important part for the players! 2s 2d. This old music game is not about nuts at all, but knots, meaning little bunches of flowers or greenery which people would gather together for Maytime decorations. The Tug of War is a traditional Maytime game, and this is a musical version. On a cold and frosty morning?